There are basically two very different points of view concerning muzzleloading rifles for hunting. First, there is the traditional school of thought regarding the rifle and equipment. 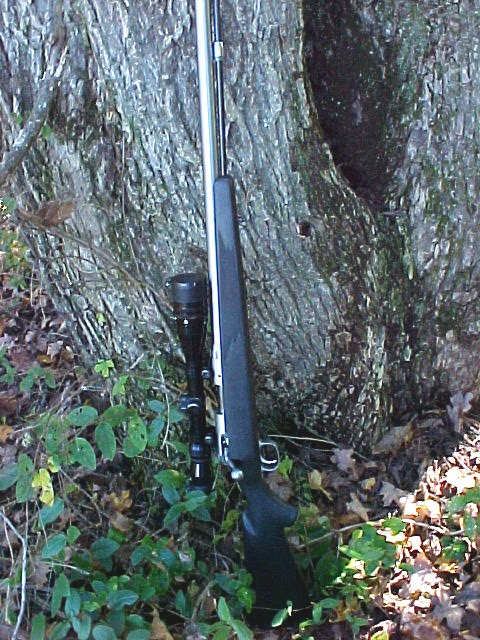 In this traditional group, most hunters use a side-hammer rifle of either flintlock or more likely percussion ignition, with either black powder or a black powder substitute. 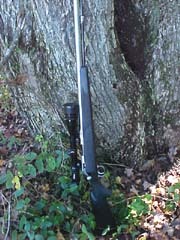 These hunters, for good reason, reject any modern equipment such as scope sights and inline ignition. The other group of hunters, we'll call them the modern hunters for lack of a better term, welcome any new innovations in muzzleloading rifles. They view the muzzleloading hunting season as time to get in more hunting by using a different weapon than their breechloading centerfire rifles or shotguns. If you adhere to the first, or more traditional, philosophy, this gun review is not for you. This article deals with the most modern and innovative muzzleloader to date. This new muzzleloader will, for the first shot anyway, give away nothing in performance to a modern big game centerfire rifle. This new rifle is the Savage Model 10MLSS-II. This new muzzleloader from Savage, while perfectly capable of fine accuracy with black powder or Pyrodex, was designed for use with modern smokeless powder, very similar to what is used in cartridge firearms. While black powder or Pyrodex performs very well, as it has for many years, it cannot equal the performance of modern smokeless powder. The main objection that I hear from hunters using black powder or a substitute is that of the daily cleaning chore following the shooting of the weapon. To the traditional hunter, this is just part of the charm of using a more primitive weapon. To the modern deer hunter who just wants to hunt, it is a pain in the neck. Inline technology in muzzleloaders has been around for a few years in its modern incarnation, and has been a welcome innovation by the modern hunter. 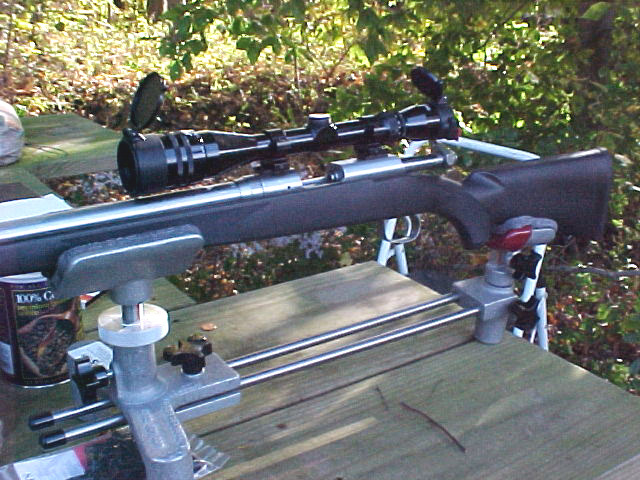 Inline rifles greatly simplify the mounting of a scope sight, and make the cleaning of the rifle a bit easier. The new Savage uses this inline configuration in their 10 ML muzzleloaders. Savage makes their 10ML in both blued steel and stainless, the latter being the rifle reviewed here. Both the blued and stainless rifles are identical except for the type of steel used in their construction, with all other specifications being the same. The Savage has a checkered, pillar-bedded synthetic stock similar to those used on their excellent centerfire rifles, and comes equipped with sling swivel studs installed. The medium-heavy barrel is free-floated for its entire length, and is fitted with open adjustable sights. Savage lists the barrel length as twenty-four inches, but the internal length, from muzzle to breech plug measures twenty-two and one-eighth inches. The action is very similar to the familiar centerfire Savage action, with the changes necessary to function as a muzzleloader. 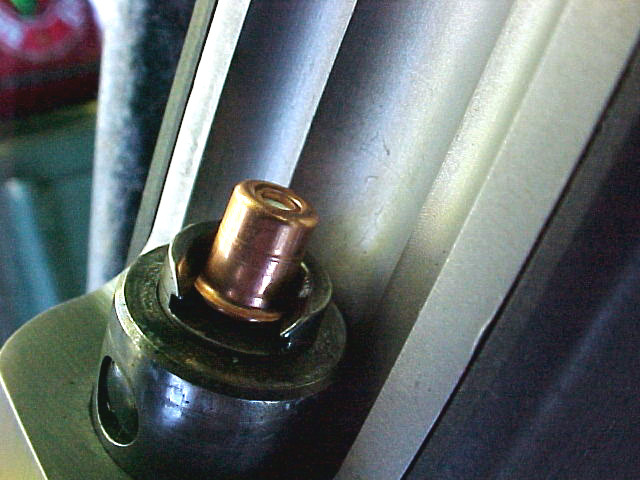 The breech face of the bolt is machined to easily accept a number 209 shotshell primer, providing plenty of fire to ignite the powder charge. 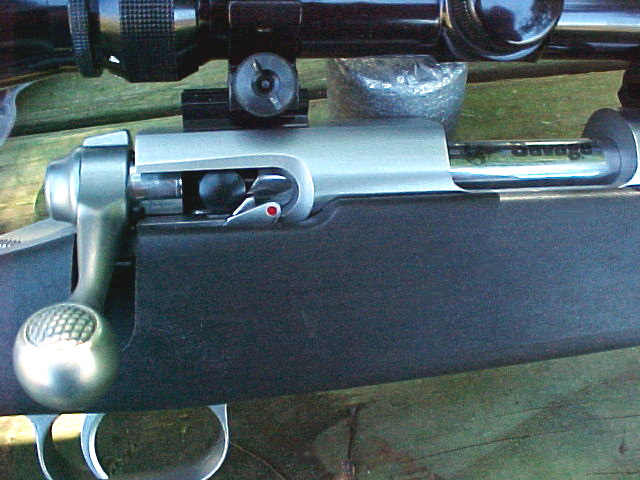 On the right side of the receiver, just forward of the bolt handle, is a cocking indicator with a red dot on its surface, which can be easily seen and felt to check the firing condition of the rifle. 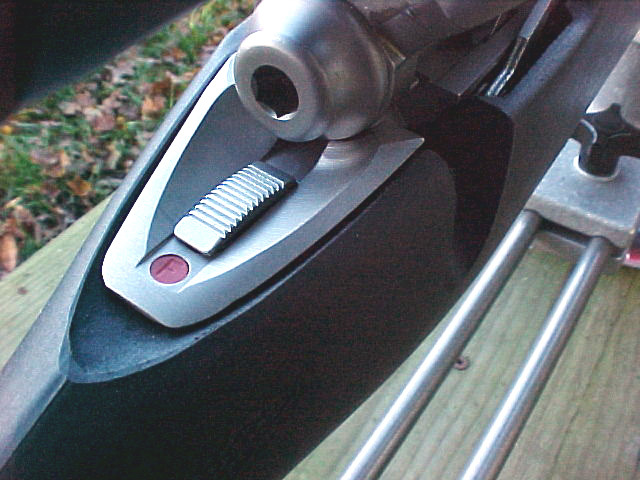 The safety is, as on all Savage centerfire rifles, right behind the bolt in the top center of the rifle, just as it should be. The receiver is drilled and tapped to accept any scope bases that are made for Savage rifles. Upon inspection of the 10MLSS-II, as the stainless version is called, the quality of fit and finish is very well done. The gun has a muzzle-heavy balance, which is a real help for offhand shooting, which often occurs when hunting. 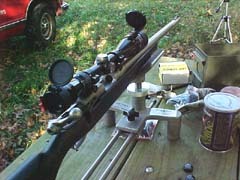 The rifle weighs seven and three-quarters pounds without scope. The trigger pull, while crisp, was a bit heavy for my taste at about five pounds, but can be easily lightened by a qualified gunsmith. This is about average for a factory rifle, and is understandable in today's litigious society. This weight of pull is probably acceptable to most hunters, but I am accustomed to using a set-trigger on my muzzleloaders. When you only have one shot, you really want it to be on the mark. What really got me interested in a muzzleloader that used smokeless powder, was the fact that the old hot-water-and-soap cleaning method needed with other muzzleloaders could be forgotten. This fact is probably the main selling point to most purchasers of this rifle, and a good selling point it is. In this aspect of the gun alone, Savage has the market to itself. No other major muzzleloader manufacturer recommends the use of smokeless powder in their rifles, in fact, they strictly warn against the use of anything but black powder or an approved substitute. Being able to come in from a long day's hunt and set the rifle in the rack, without the messy cleaning, is a welcome bonus to most hunters. While the clean-shooting characteristics of the gun got my attention, what really surprised me is the performance of the weapon, as compared to every other muzzleloader on the market. Savage's literature that accompanies the rifle lists some pretty impressive loads using three different smokeless powders. The data includes loads using Vitavouri N110, IMR 4227, and Accurate Arms XMP-5744, all of which are relatively fast-burning for a rifle powder. The loads listed by Savage will beat black powder loads, with the same bullet weights, by several hundred feet-per-second. I decided to try some different powders for this article, since Savage had already done the work with the powders listed. All powders were within the same range of burning speed to the powders listed above. I assembled all the necessary components and equipment needed for an exhaustive workout of the new rifle. I was a bit apprehensive at first pouring smokeless powder into a muzzleloader, having been warned most of my life never to do so. I do want to interject at this point never to use smokeless powder in any muzzleloader other than the Savage, until such time that others make their rifles to handle the pressures. Also, you must be very meticulous in measuring the powder, and I strongly suggest weighing each powder charge. This muzzleloader is not for the careless amateur, but for the serious shooter. While a slight overcharge with black powder is no big deal, overcharging with smokeless can cause serious harm to the gun and shooter. The 10ML uses bullets of either .451 or .452 inch diameter in fifty caliber magnum sabots. Be sure to use the magnum sabots, as the cheap soft ones give unsatisfactory results with the velocities of which this rifle is capable. All range testing was done on a sunny day with temperatures between 55 and 70 degrees, with slight to gusting winds, which made the task of weighing powder charges difficult with the wind playing with the balance beam scales. Velocities were monitored with the aid of the excellent PACT chronograph. The PACT makes all the mathematical calculations of standard deviation and extreme spreads so that the shooter can concentrate on the shooting. All shooting for groups was at 100 yards, with the aid of a Tasco 4 to 16 power target scope. The accuracy of this rifle was very good with every bullet tried, but the best were the Hornady 250 grain XTP, the Hornady 300 grain XTP, and the excellent Cast Performance 335 grain LBT-style cast bullet. 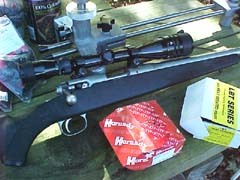 Of the sabots tested, the Hornady proved to work the best in this rifle. 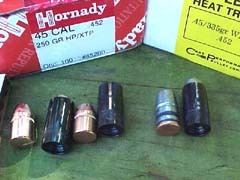 These three bullets shot into five-shot groups of between one and one-and-one-quarter inches at 100 yards. The aggregate group for thirteen different loads was less than three inches. The loads that proved to be amazing to me used the three listed bullets above with Hodgdon's Lil' Gun powder. This powder, which has already become one of my favorite pistol powders (see Jeff's article at Hodgdon Lil' Gun Powder), turned in good velocities with each bullet tested, and the spreads and deviations were some of the best I've ever seen. 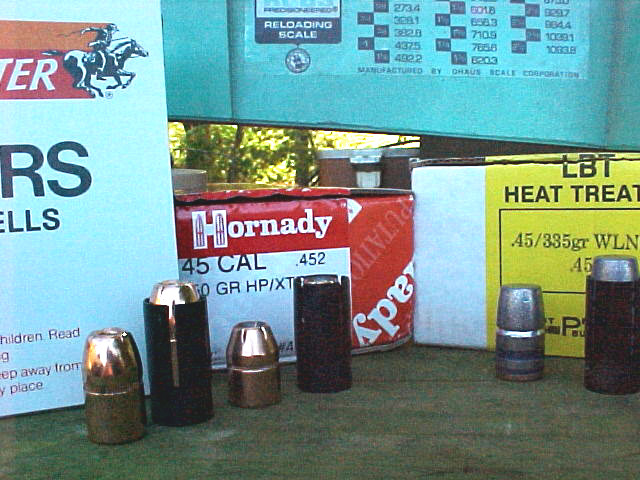 I was able to reach speeds approaching that of a .375 H&H Magnum with equal bullet weights. 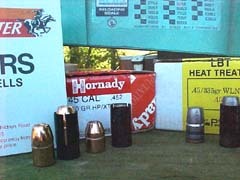 For example, the loads with the Hornady 250 and 300 grain bullets using Lil Gun averaged 2552 and 2432 fps, respectively. The Cast Performance 335 grain averaged 2370 fps with Lil Gun. This relates to around 4300 foot-pounds of energy at the muzzle. As a comparison, this muzzleloader has more retained energy at 300 yards with these loads than the mighty .454 Casull has at the muzzle out of a handgun! This kind of performance from a fifty caliber muzzleloader is amazing. Most other inlines won't do half of that. I also need to interject here that neither Hodgdon nor Savage recommends this powder in this gun. The loads were safe and very consistent in this rifle. I believe that Lil Gun is the best powder to use in this rifle, and beats the performance of the other powders significantly, but I will not list the charge weights here. You will have to determine what is best in your particular gun, but I am sticking with Lil Gun in this Savage. The significant fact about this load, with either of the bullets, aside from the awesome power, is the trajectory. With a 200 yard zero, you can hold dead-on out to 250 yards without the bullet varying from line-of-sight more than three and one-half inches. This gun is, in capable hands, a 250 yard or better muzzleloader. It will place the bullet on the mark, with power to spare for most any game. With the Cast Performance bullet, this gun has ample power for any animal on this continent. If you are inclined toward an inline muzzleloader, the Savage is the logical choice. It beats the competition in power, trajectory, and ease-of-maintenance. On second thought, the Savage has no competition, as it is the only game in town for a smokeless muzzleloader. Our local gun dealer, McLain's Firearms in Carlisle, Tennessee, can't keep them in stock. They go out the door as fast as he can get them in. I never really cared at all for an inline muzzleloader, as my old side-hammer Hawken has served me well, but this new Savage is a whole new concept in power and performance, just by virtue of using a propellant that has been around for more than 100 years. Check out this Savage 10 MLSS-II online at: www.savagearms.com. Suggested retail is $451 in blued steel and $507 in stainless as of this writing. For the traditional hunter, any inline muzzleloader seems out of place in the woods, but for the modern muzzleloading hunter.......... this Savage just made all other inlines obsolete. Savage's Model 10MLSS-II is a truly revolutionary muzzleloading rifle, offering accuracy, power and ease of maintenance never before seen in a muzzleloader. The 10ML's bolt face is modified to accommodate the use of shotshell primers, allowing swift and reliable ignition of the smokeless powder charge. The excellent safety system of the 10ML is simple, reliable and perfectly placed for right-handed shooters or for southpaws like the author. 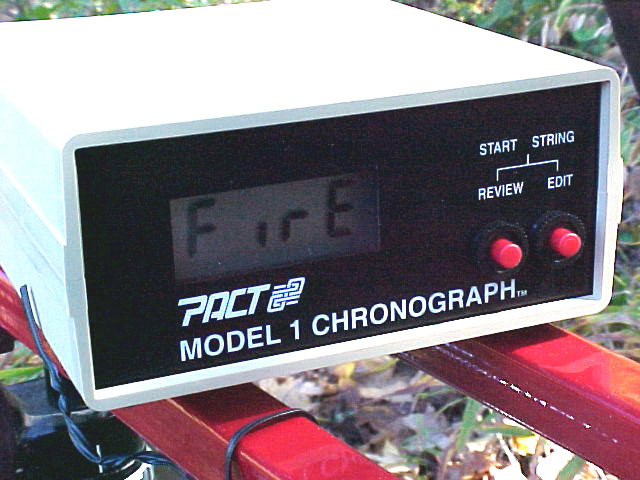 All shooting was done over the author's trusty PACT chronograph. The PACT has served the author well for nearly 20 years. The Savage 10MLSS-II follows the tried-and-true design of Savage's breechloading centerfire rifles, modified only as required for muzzleloading. The 10MLSS-II proved to be a fine performer from the bench, giving good accuracy at power levels never before seen in a muzzleloader and approaching the performance of a belted magnum! The Savage Model 10MLSS-II is a quantum leap in muzzleloading evolution. This rifle offers accuracy, durability, weather resistance, ease of maintenance and unrivaled power, truly standing alone in today's modern muzzleloading rifle market. If you are looking for a muzzleloading rifle that offers everything desired by the serious hunter in a non-traditional and innovative package, look no further than Savage's Model 10MLSS-II.